As soon as the weather warms up enough, usually in early to mid-June, it is time to take out the animals for the summer. For some, it is a fairly easy task and only requires a few basic preparations. Moving the pig hut to a new location was first on the list. Last year's lot was muddy and wet after the winter so the hut and the grain feeder was relocated up higher on the hill where it would be dry and warm. Then Gustav loaded up a large straw bale (and a surprise stow-away) in the loader of the tractor and took both up to the new digs. The hut was lined with straw that would be replenished all throughout the summer so that the little porkers would be dry and warm and the grain feeder was kept full of barley to supplement the fresh water and vassle (a whey by-product from the cheesemaking) that they also had in abundant supply. Both Tony and The Jar were unloaded happily from the haywagon into a soft, grassy field. The older cows and bull are also relatively easy. They 'know the drill' and will walk along quite cooperatively to the field where they soon learn that the new lush grass is waiting. This year we had a little glitch because we had what we called "The Young Mother's Club" consisting of two of our younger cows, (but more about that later in the post). There they are waiting with the larger bull in the left picture..you can see the bull and the brown and white by the water trough and just behind her the back of the other member of "The Club". Maxie walked them all out with ease and opened the gate of the field for them to start their summer grazing. If it is still too chilly we let them out in the day and bring them in at night until it is comfortable enough for them. They love to be out in the fresh air. The sheep are loaded up into the horse trailer and taken with the young bull and "Mellankalvar", ("middle calves" or young heifers who have never been pregnant) to the beautiful fields at the village of Östansjö where they will stay for the summer months. They have been indoors from birth and they have been in a group. Going anywhere alone, and certainly going out of the barn is completely unfamiliar to them. To add to the trauma, for their own safety they must be taught that the fence is electric. That requires coming close enough to get just a tiny "zap!" so they will stay within it's bounds. They are young but they are strong and it is important that they learn. Both the boys were so patient with them and encouraged them along reassuringly but firmly. They managed it really well. It's said that in farm life there is always something new. The first was this cow who had been pregnant and quite ill in the late winter. We had the vet come who did all possible, but we didn't know if the calf would survive. We kept the mother in a separate stall and she had the best of care. Calving season came and went, but nothing from her. So when it came time for the cows to go out in June, it was still a question as to whether she had retained the calf. Gustav kept a close eye on her in the field because of course she never came in to milk. In late July he saw a change and brought her in to one of the calving stalls that Pappa had made. Sure enough she gave birth to this beautiful calf. Maxie loved it and made sure the little rascal couldn't crawl through the bars onto the feeding table. He fastened on a board as a barrier for safety. The second case requires an explanation of how "The Young Mother's Club" came to be. Each Autumn as the weather begins to change and the grazing is depleted, we have to go every day to Östansjö to check that the heifers, young bull and sheep there have water that isn't frozen and a bale in the feeder. One morning in late September it was Manny's turn to do it and he returned to tell us that there was a "new calf at Östansjö". We could hardly believe it, but it was true. There were actually two heifers who had given birth to a calf each, but one had not survived. It was totally out of sync time-wise. When we tried to figure out how it could have happened we realized that in the previous December there had been an incident in the Ungdjurstall (young animal barn) where the four young heifer calves were housed, when the gates had been left open for a short time unnoticed during the feeding and cleaning. When the boys discovered it they closed them up immediately. There was no sign that any of the four heifer calves, who were only 8 months old, had strayed out of their pen. The only plausible explanation was that during that little break in the security somehow two of the four heifer calves managed to get over to the young bull, who was in the same barn but in a different stall, and get pregnant. And this is the little heifer calf that survived.We named her Pearl, she was so, so white and she was beautiful. We fed her with a bottle and she was in a warm pen by herself, but she was lonely. 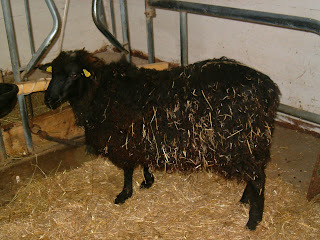 Out of the blue, at about the same time, a woman called us that Pappa had contacted ages before looking for a black ram. She had one and was ready to bring it to us. Pearl and Basil have never been separated. Because of her late birth she couldn't go with the young bull this year at Östansjö. Instead, she and Basil spent the summer in Nina's pasture two farms down from us. All summer long we saw them romping together in the field, and sleeping side by side during the warm summer afternoons. They were and are an unlikely, but companiable pair. We were just a little later than usual getting all the fur-babies out this year. It was the third week in June by the time it was all accomplished. I am always amazed at how the young ones adjust. Manny says they are a lot like children in that respect. When they first go out they stand by the fence and wail and carry on all day long. But if, as you are working around the farm, you go by and talk to them soothingly and in a comforting voice, they settle in very quickly. Some of the farm people around us say we are "too soft". That you have to "show them who's boss". In some cases with the animals that is true. But in this case, we always err on the side of kindness. We no sooner got the garden planted and covered than it started to rain. And it rained, and it rained, and it rained, and it rained. Every time we turned around it was belting down...water everywhere. It wasn't particularly warm either, some days only about five degrees above freezing. I began to worry about my garden seeds. I knew it must be pretty soggy under that fiberduk. I needn't have been concerned about the twenty seven rhubarb plants that run along the side of the Vävstuga. Look at the ground around them, how wet it was, and also up close you can see all the drops of rain on the leaves. They went from "barely up" (left picture) to "thriving" (right picture)..
On the plus side of the ledger were the lilies and the iris that came up again after their first blooming last year. These were the ones brought from the far north in Sweden. And most thrilling of all, we saw buds on our peonies! All of our weeding and hoeing and dunging of these tender plants finally paid off! It promised to be quite a year in the growing department. The following pictures were taken only ten days after planting. You know when you can start lifting the fiberduk because you begin to see the rows of plants that have come up under it. We wondered when we saw the bulges if it could possibly be true? The onions shown here on the left were the first to be exposed. They were so tall! We had never had a year with this kind of speed but we were surprised to find them relatively weed-free. Not so with the carrots. It goes without saying that if the seeds you have planted enjoy the warmth and protection of being covered, so do any weeds that may be lurking under there. This part of the carrot section needed some fast attention so it didn't get ahead of me. It is a large garden, especially for one person to maintain, so there is never any time to wait. I had to be on top of it. While I was weeding it one day Bo Henriksson, our dear friend from down the road came by and looked at it and said to Hans, "Didn't she just plant that?" On the same day we came face to face for the first time with this lettuce, the new blended strain that we tried. When we took off the fiberduk it was already 7" high! If the garden was mine, the seven 40 meter-long rows of strawberries that were planted last year belonged to Hans and the boys. Another ten days passed and those plants were begging for relief. Hans rototilled between the rows and Elders Murri and Bracken worked with Maxie and spent the day freeing up as many plants as they could. When they were done the back of it was broken. Now we were twenty days in from planting. I finished the first complete weeding of the garden and there was only one precious day before I had to start harvesting spinach. and the big cast iron cooker/planter by the threshing barn at the entry to the inner farmyard. begun to burst into bloom. In the next week we all helped so that the weeding of the strawberries would be finished, the spinach would be harvested, trimmed, washed, blanched, packaged and frozen for the coming year and the weeding of the potato plants would be started. It really was "zero to sixty" in about four weeks flat! and turnips and parsnips and a row of pink and white flowers and parsley and dill and kale and mangold and red currants and black currants and gooseberries and the bright yellow and orange flowers that can survive anything all summer in Sweden! As the wagons come rolling in it is a beehive of activity! You can hear the chug-chugging of the conveyer belt inside as it moves the hay out the back. You can hear the roaring suction of the hay vacuum as the hay gets forked in and flies up the tubing, across the upper levels and down into the hay barn. The days start early and end late. in the land of midnight sun. Gustav and Maxie were definitely the 'Dynamic Duo' bringing in load after load without a break. They worked tirelessly and without complaint along side Pappa and I and did such an excellent job. you plug the pipes and the entire assembly has to be dismantled and cleared. and also a haywagon full of fun! To the left of this gridwork in the haybarn is a mountain of hay! The big wooden columns you see are supports for more hay to be blown down between them as overflow. Haying season is such a critical time. To an enormous extent you are at the mercy of the weather. You must be willing to work around the clock if necessary to 'get it in'. Having enough feed for your animals for the long winter (8 month's worth) is not an elective. "Please pray for the farmers...they need rain". And I would. "Please pray for the farmers...that the rain will stop". And I would.